NetherRealm Founder Ed Boon says that fans can expect more DLC characters, including a "big" one coming in the future. 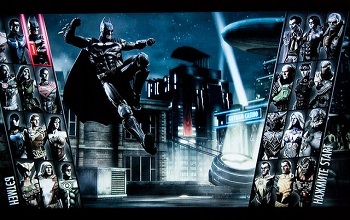 While the overall reception to Injustice: Gods Among Us, NetherRealms' DC Universe fighting game, was generally positive, the game didn't leave fans without any complaints. Among the bigger grips expressed by many players was the heavy focus on characters that originated in Batman and Superman stories. It was a complaint that saw little rectification as the developer announced DLC characters which, with the exception of Mortal Kombat's Scorpion, again all hailed from the streets of Gotham and Metropolis. NetherRealm finally broke this habit when it announced recently that Martian Manhunter would be joining Gods Among Us as its next downloadable fighter. According to NetherRealm founder Ed Boon, however, Martian Manhunter is still just the beginning. Responding to a fan inquiry on Twitter, Boon confirmed that Martian Manhunter "is not the last" DLC character coming to the game. This probably doesn't come as a surprise, given the vast array of DC characters still left out of the roster. That said, Boon would post a second, arguably more interesting Tweet, just a few minutes later. Responding to another fan about future DLC, he said that a character coming to the game "is a BIG fan favorite request!" The question forces us to ask, of course, who the heck this "fan favorite" will be? Running on the assumption that NetherRealm won't be adding another Batman/Superman character for at least a little while, there is still a plethora of possible candidates. Personally, I'd love to see Etrigan thrown into the mix, if only because I really enjoyed Demon Knights and was sad to see it cancelled. That said, there are dozens of options for NetherRealm to choose from and more than a few that could arguably qualify as "fan favorites."